For Lucks, having a “good” handle on gene expression might be an understatement. He and his team have developed a powerful and versatile tool that achieves gene activation thousands of times better than nature. Supported by the National Science Foundation, the Defense Advanced Research Projects Agency, and the Searle Funds at the Chicago Community Trust, the research was published online on October 19 in the journal Nature Communications. 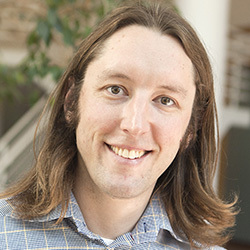 James Chappell, a postdoctoral fellow in Lucks’s laboratory and now an assistant professor at Rice University, served as the paper’s first author. Using a computational design approach, Lucks created the switch by molecularly programming an RNA molecule called called Small Transcription Activating RNA, or STAR that his group had previously discovered. He then uses an algorithm — developed by Northwestern alumnus Joe Zadeh (’03) — to optimize the STAR for specific applications. An outside company uses the algorithm’s results to construct a physical piece of RNA, which Lucks then uses in experiments. Continuing the analogy, the RNA switches found in nature are unable to turn the “lights” fully on or off. Often times the room is consistently dim instead of completely dark or brilliantly light. But researchers have desired to have a tighter control of the system. Lucks’ STAR can turn on the light — or activate a gene — 9,000 times brighter than without the STAR present, providing the completely dark or light room that researchers have lacked. That’s particularly true for diagnostic applications, which Lucks plans to pursue next with his new tool. Because RNA excels at detecting other strands of RNA, STARs could be useful in diagnosing RNA viruses. To do this, Lucks’ switch could be engineered to turn on in the presence of one of these viruses.